After most of humanity was wiped out in the Mindvirus Plague, the world’s foremost superpower in 2072 is New Australia. As this nascent Southern empire struggles with a series of murders called the Moneybook killings, the machine cultist Jonty Gillespie is trying to stay alive and out of trouble until his team can win the nation’s premiere virtual reality fighting championship. Acting on the belief that machine cultists are behind the Moneybook killings, the XSA agent Richard Nordmark coerces Jonty into an adventure that encounters exotic drugs that open dimensions he’s never imagined, mind doctors who live to crack the minds of other men, a communitarian technocult balancing between triumph and oblivion, and technology that forces him to reevaluate his understanding of what it means to be human. Jonty’s developing involvement with the remote mind control device called the Verity Key gives him more power than he could ever have dreamed of, and with it the responsibility to confront the violence in his past and in the hearts of other men. Critics enjoyed Vince McLeod’s portrayal of protagonist Jonty Gillespie, who begins the story a hedonistic nihilist but who finds within himself a purpose to keep fighting even when all seems lost. 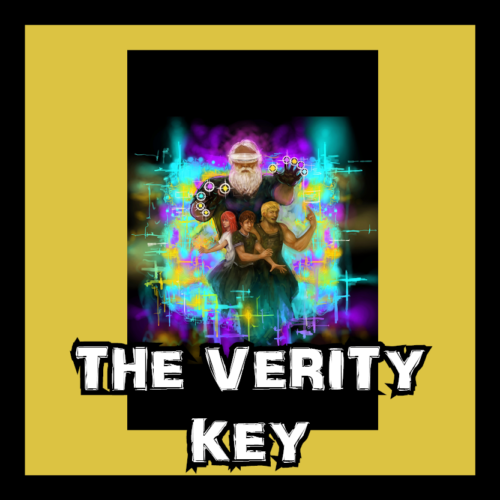 New Zealand readers can buy a paperback copy of The Verity Key from TradeMe HERE. International readers can buy a paperback copy of The Verity Key from Amazon HERE. New Zealand and International readers can buy a Kindle copy of The Verity Key from Amazon HERE.